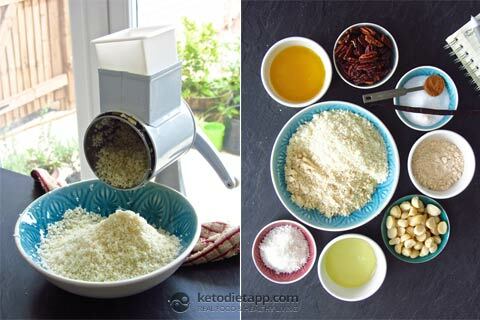 Before I get to my new recipe, there is something I need to clarify: It's been a busy week for us, as we have been working on an urgent fix for the KetoDiet apps. I strongly advice you to download the latest update, as all in-app purchases will work as expected. However, there is something I need to clarify: If you bought any of the optional packages (in-apps) between 29th August and 3rd September, you may have noticed that they appeared locked following the update. What really happened is that the in-apps kept failing and the packages were never purchased which means you were never charged for them. As I mentioned in my previous post, you can never pay more than once for the same package. No matter how many times you may have been prompted to purchase a package, you are only charged the first time you buy it and never again. You can confirm that by checking your bank statement. Also, if at any point you find any of the packages you have previously bought locked (can happen when you reinstall the app), tap on Settings in KetoDiet (the round wrench icon at the bottom-right corner) and then tap "Restore all purchases". This will restore all the packages you have ever purchased. Now, let's get back to my recipe. 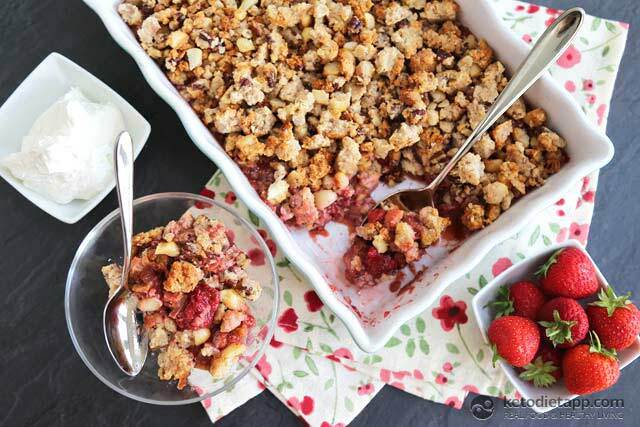 This Strawberry & Rhubarb Crumble was inspired by this delicious Rhubarb Crisp by Carolyn Ketchum, the very talented writer and photographer at All Day I Dream About Food. 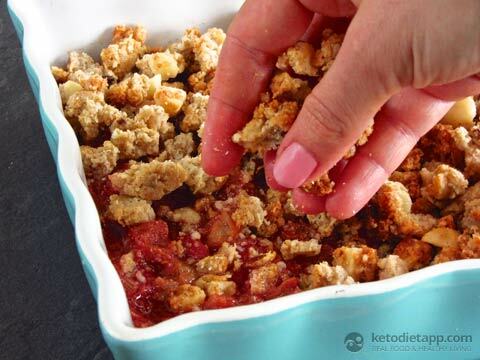 What really makes this crumble special are the macadamia nuts which are not only delicious but also high in heart-healthy monounsaturated fats (you can learn more about fats in my guide here). 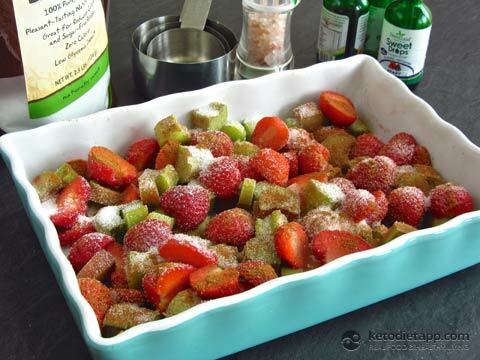 I don't always have fresh strawberries and rhubarb, so I either use frozen or preserved fruits (recipe for Home-made Strawberry & Rhubarb Jam is here). Like many other recipes on my blog, this recipe is high in fat (79%) and, therefore, suitable for the fat fast. Preheat the oven to 200 °C/ 400 °F. 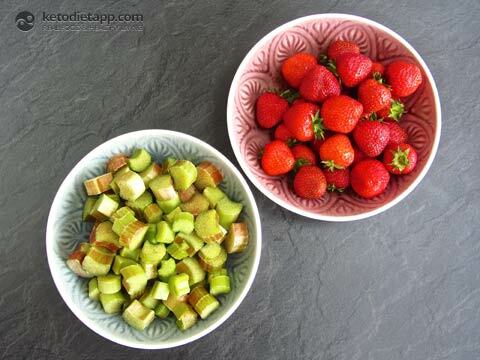 Slice the strawberries and rhubarb. 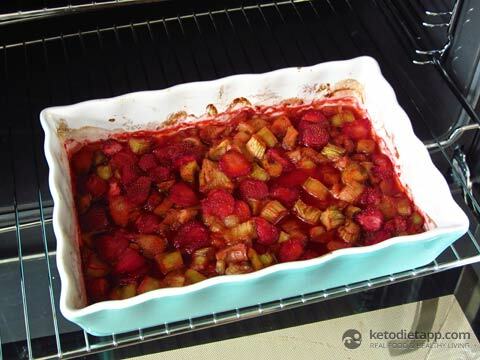 Place the strawberries and rhubarb into a baking dish. Add Erythritol, stevia and cinnamon and mix well. Place in the oven and bake for about 30 minutes. 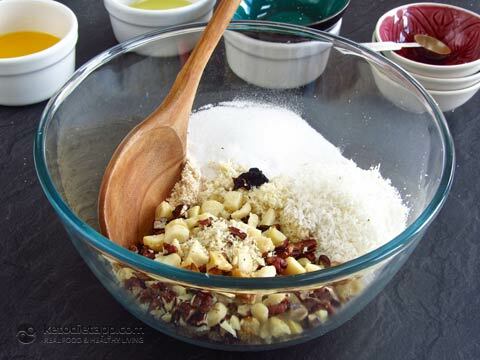 Mix once or twice to prevent burning. When done, set aside. Keep the oven on but reduce the temperature to 150 °C/ 300 °F. 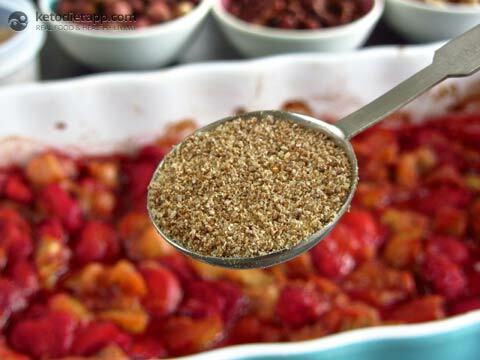 Add ground chia seeds and mix well. 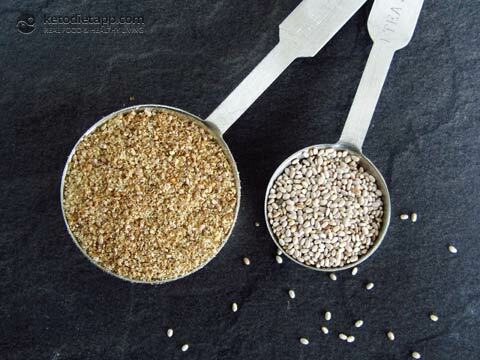 To grind the chia seeds, you can use a blender or coffee grinder. Meanwhile, prepare the crumble. Grind the macadamia nuts. 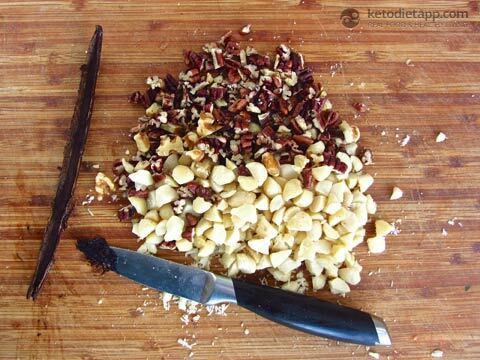 Chop the pecans (or walnuts) and the whole macadamia nuts into smaller pieces. 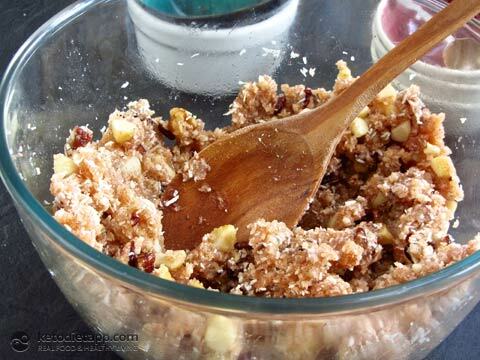 Mix all the dry ingredients in a bowl (ground macadamia nuts, chopped macadamias and pecans, almond flour, whey protein, desiccated coconut and salt). Add melted butter (or coconut oil), egg white, vanilla extract and stevia. 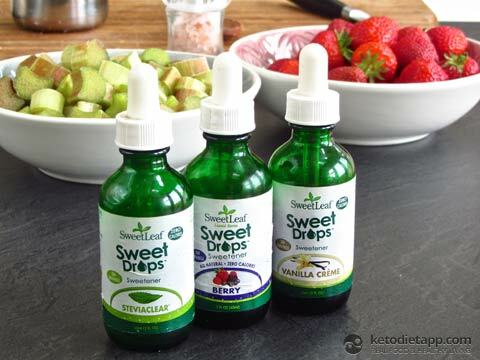 You can use berry, vanilla or clear stevia. 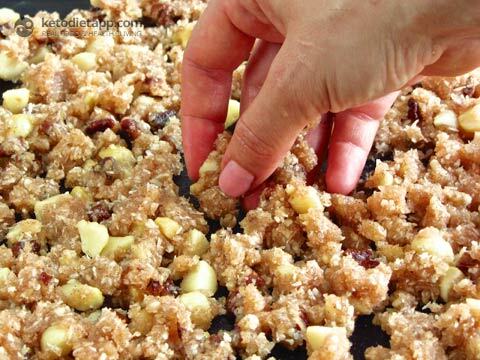 Crumble using your hands and place on a baking tray lined with baking paper and transfer into the oven. Cook for about 20 minutes at 150 °C/ 300 °F. 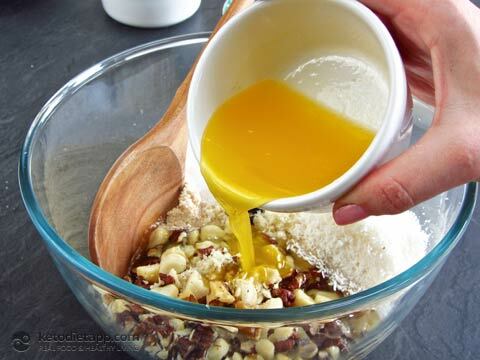 Make sure the batter is distributed evenly all over the tray. 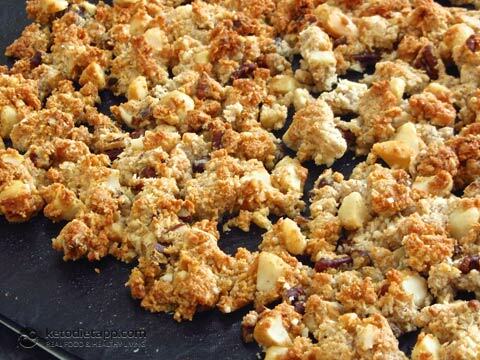 Top the fruit mixture with the crumble evenly and set aside. Serve with a dollop of soured cream or full-fat yogurt. This was marvellous! 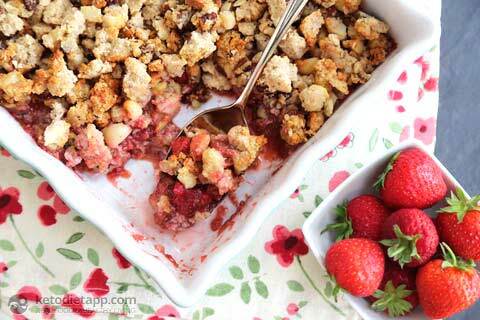 Especially the crumble. I had a bit too much, so I had it in the morning as a crunchy cereal, with some coconut milk. Absolutely delicious. Thank you for this recipe! How important is the combination of protein powder, egg whites, and coconutoil/butter? Could that all be substituted for 2 whole eggs well beaten? This is one of the best recipes I've tried. I can't believe how good it tastes just like the crumble my mother used to make when I was a kid. Thank you so much! This looks delicious! I’ve been looking for a low carb recipes, I must add this to my list. 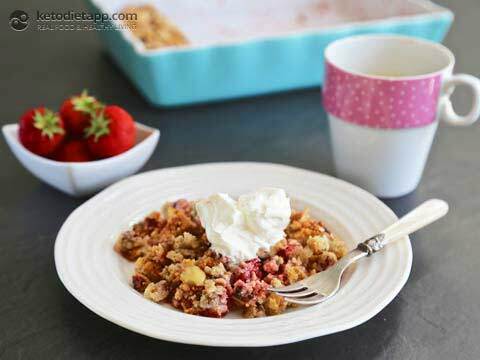 How delicious is this crumble! 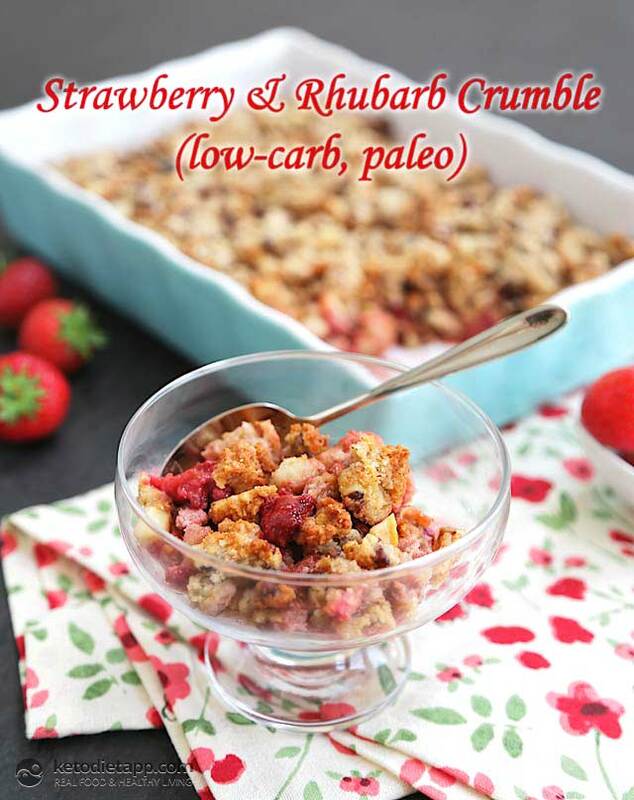 Love how good for you the recipe is too in comparison to other crumbles, I definitely need to try out the recipe! I love crumble! What do you think, would the crisp work with some almond milk just like cereal... I mean without the strawberry base? Me too! I think it would but make sure you don't leave it in the milk for too long or you will lose the crispiness.